This is another great figure set in our new GEN 2 series! This series sets the new standard with detail and realism almost beyond comprehension. Novgorod, located south of Leningrad, is a prominent historical city in northwestern Russia. Interestingly, its name means ��new city��. And after the brutal fighting of WWII, a ��new city�� had to be virtually rebuilt on the site. Originally occupied by Germany on 15 August 1941, it was recaptured on 19 January 1944 by a massive Soviet offensive. Fighting was vicious, and of 2,536 stone buildings in the city, less than 40 remained standing after Novgorod��s liberation! Out of this bitter battle stagger four survivors of the 1st Luftwaffe Field Division who are in full retreat. These weary, ragged figures are clad in quilted Luftwaffe parkas and trousers, some with typical rectangular patterns, and some with small diamond patterns. A member of the quartet supports his wounded comrade as he hobbles as fast as he can to escape the Soviet maelstrom. 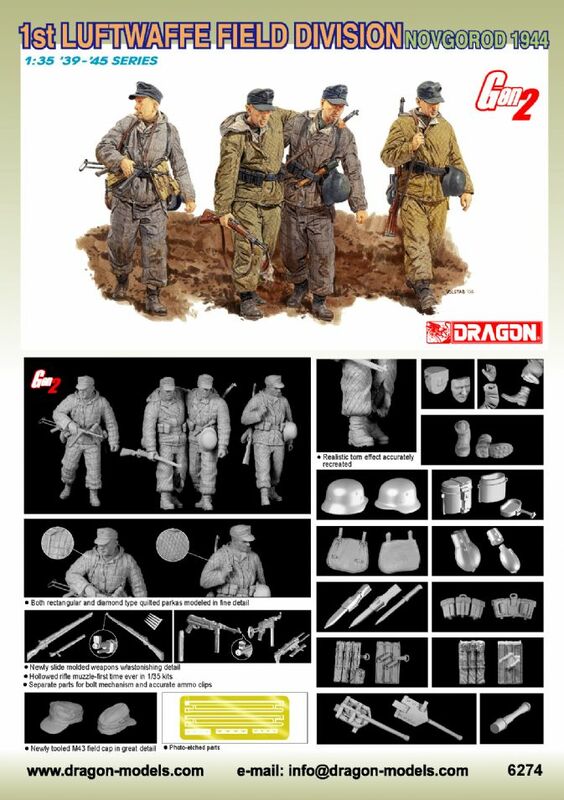 Figure sets don��t come much more realistic than this, with the poses and facial expressions all speaking of the German survivors�� resignation and exhaustion �V just perfect for an atmospheric diorama! Furthermore, the detailed equipment and weapons are of the highest possible quality, with even the Luftwaffe buckles and insignia provided in photo-etched metal parts. Relive this historic battle with another superb Dragon Gen2 set of figures!